If you had a tough time during the Great Recession of the last few years, you are in the same boat with many, including the United States Postal Service. With computers, e-mail, and the rise of similar types of technology, total mail volume was already on the decline - and then, the most troubling economic times in decades hit. All types of mail volume dropped dramatically in a short period of time. According to the official USPS website, total mail volume in 2006 was roughly 213.1 billion pieces of material. The total mail volume in 2015, on the other hand, was 154.2 billion. While that's still a lot of mailers, flyers, and other items being delivered across the country on a daily basis, a drop of that magnitude is still pretty staggering. Because of this situation, the USPS asked for something called an Exigent Rate Case. That meant that due to demanding circumstances, the Postal Service was allowed to "raise market-dominant prices above the CPI-U (consumer price index) price cap" for a limited time. After an approval process that required a submitted proposal and a hearing conducted on the record with an opportunity for public comment, that increase was granted - leading to the current rates that we're experiencing. Exigent Rate Cases are not permanent - they have a limited lifespan as, theoretically, the special circumstances that required them in the first place will resolve themselves eventually. This is exactly what is happening. When the emergency rate expired on April 10, 2016, most of us experienced the first postal rate drop in our lifetime. With the price of a first-class stamp dropping to 47 cents, it represents the first decrease in nearly 100 years. 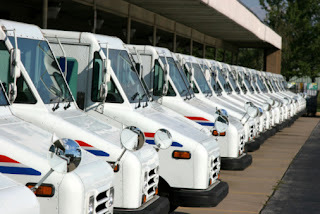 Megan J. Brennan, the current Postmaster General, said that multi-year revenue declines are still a very real concern and were in excess of $7 billion in 2009 alone. In a statement she would go on to say that "Removing the surcharge and reducing our prices is an irrational outcome considering the Postal Service's precarious financial condition." Not to worry, though. The United States Postal Service isn't going anywhere anytime soon - however, exactly what these rate decreases will do to their bottom line remains to be seen. One thing is for sure, as previously stated, there has never been a better opportunity to truly experiment with the benefits that direct mail has in terms of your overall marketing efforts. If you've moved more in a digital direction due to increased mailing and shipping rates over the last few years, this rate drop is the perfect incentive to dip your toe back in these proverbial waters. Give us a call at Print It! we specialize in direct mail marketing!